Jan. 10, 2017, 1:39 p.m.
By Ricardo Bilton @rbilton Jan. 10, 2017, 1:39 p.m.
It’s a dangerous time to be a journalist in a courtroom. Aggressive lawsuits against Gawker and Mother Jones, and more recently Techdirt, risk a chilling effect on news organizations and embolden powerful people with the financial wherewithal to level lawsuits against stories they find fault with — regardless of whether the stories actually make any false claims. At the same time, the money woes of many news organizations today have put proper legal counsel farther out of reach. Legal spending hasn’t been immune to cutbacks at big media companies, and in-house counsel is a less common sight at newer, smaller media companies. This scary new world is one that journalism schools are doing an uneven, largely inadequate job of preparing students for, according to a new research paper by Jeff John Roberts, a Knight-Bagehot fellow at Columbia and reporter at Fortune. He examined the syllabi of 12 media law courses at journalism schools and found that the way law is taught lags greatly behind the realities of the media industry today — particularly in assumptions around reporters’ ability to defend themselves against legal threats. “I don’t want to sound shrill, but I think it’s an emergency out there and we need to make students aware of the crisis that journalism faces,” said Roberts. “The Charles Harders out there are smelling weakness and are pressing their advantage.” The problem is particularly dire for younger journalists entering a media environment where speed and volume matter more at some outlets than editorial oversight and accuracy — which can open them up to greater risks of litigation. The limitations of media law courses extend to the topics they cover. In his research, Roberts found that journalism schools rarely teach key digital legal topics such as net neutrality, encryption, the legal liability of retweets, and the “right to be forgotten.” In a sense, media law courses at journalism schools are subject to the same problem that some journalism schools face as a whole: an institutional bias towards print and broadcast reporting over today’s digital realities. Even though online platforms are where nearly all journalists today begin their career, the internet is often presented as a bolt-on topic when it comes to media law. For instance, journalism textbooks include chapters like “Special Considerations: How the Internet has Affected Publishing and the Law” or “The First Amendment and the Information Superhighway.” Other course material referred to “blogs” and “zines” in a way that suggested online platforms remain the province of cranks or amateurs. There are some bright spots, however. Since publishing his research, Roberts has gotten some responses from media law professors who have shared examples of how they’ve covered big digital media concepts. Chip Stewart, a professor at Texas Christian University, said one of his students’ first assignments is to learn how to send an encrypted email. 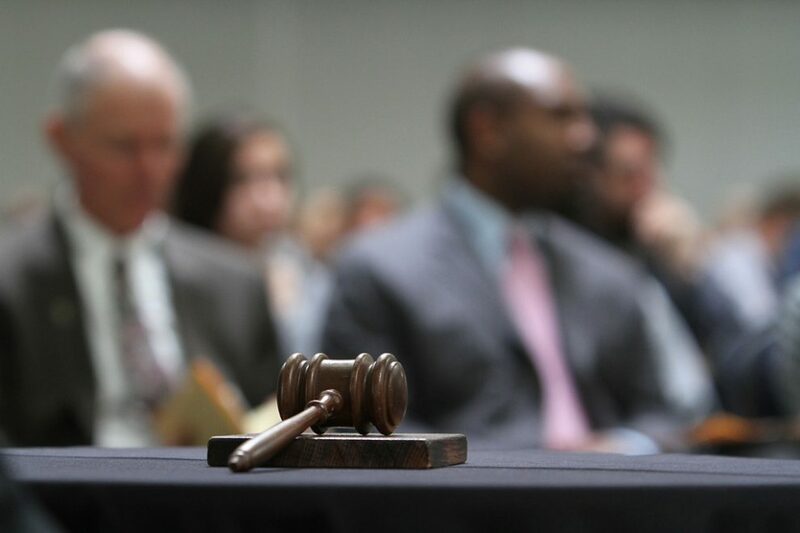 Photo of a gavel by Shawn used under a Creative Commons license. POSTED Jan. 10, 2017, 1:39 p.m.
Bilton, Ricardo. "When it comes to legal issues, journalism schools leave students unprepared, a new study argues." Nieman Journalism Lab. Nieman Foundation for Journalism at Harvard, 10 Jan. 2017. Web. 23 Apr. 2019. Bilton, Ricardo. "When it comes to legal issues, journalism schools leave students unprepared, a new study argues." Nieman Journalism Lab. Last modified January 10, 2017. Accessed April 23, 2019. https://www.niemanlab.org/2017/01/when-it-comes-to-legal-issues-journalism-schools-leave-students-unprepared-a-new-study-argues/.